That’s what one “proponent” of the compromised substitute language in HB 142 said in today’s committee hearing at the Statehouse in Columbus. As you know, this afternoon was the House Federalism Committee hearing on substitute language for HB 142. HB 142, as originally written, would’ve joined Ohio with the 36 other states that do not require law-abiding gun owners to notify an officer they are carrying a firearm. But today’s meeting was to consider “substitute language” that would keep intact the duty to notify and instead only lower the penalties and fees for not doing so. I don’t know about you, but I get sick and tired of politicians telling gun owners what they need to settle for. And when there are larger “pro-gun majorities” than any time in Ohio history, there simply isn’t any excuse. Like you, I know that voters are the real bosses of the politicians in Columbus. But as I sat there and listened to the back-and-forth of the hearing, it became evident who the politicians were trying to appease – and it wasn’t voters like you and me. Instead, they are lending their rapt attention to law-enforcement association lobbyists, doing their bidding by gutting HB 142’s original intent. Rank-and-file police officers, the guys and gals actually on the front line in the war against crime, are 100% behind repealing the “duty to notify” – and they tell us that! They know just as well as you and I do that law-abiding gun owners are Ohio’s safest and peaceful citizens – bar none! And they also know that a violent criminal isn’t ever going to tell them that they’ve got an illegal gun or that they intend to commit a crime! So for the politicians to bow down and kiss the ring of special interest groups instead of gun-owning voters like you and me who elect them is not acceptable. Below is the testimony I offered to the committee today on behalf of Ohio Gun Owners, our members and our supporters. Unfortunately, the committee voted to adopt the new compromised language and send it to the House for a full vote. We will be working with legislators to find a solution to restore this legislation going forward. But in the mean time, it is more critical now than ever before that you take action on the other MAJOR pro-gun bill that is still in the Federalism Committee, HB 201. 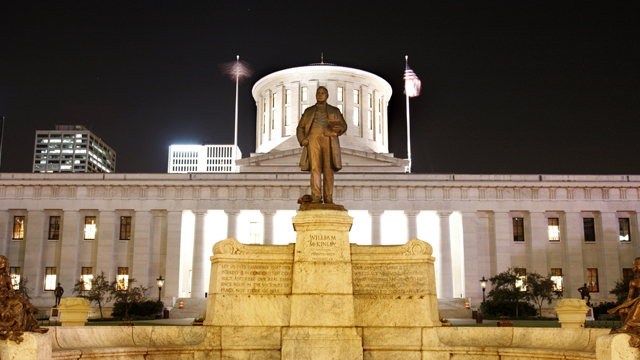 HB 201, the Constitutional Carry bill by Representative Hood, cleanly addresses repealing the duty to notify clause that is in Ohio’s code and makes Ohio the 37th state with this provision! And I know for a certainty that Ohioans are just as good as the best citizens in any other state! That’s why it is critical that you stay tuned for our next email update that will have contact information and action items for you to help get HB 201 through the Federalism Committee! But please take a moment to read the testimony below that I offered to the Federalism Committee. Chair Roegner, Vice Chair Lipps, Ranking Member Leland, and members of the Federalism and Interstate Relations Committee, thank you for the opportunity to offer testimony on House Bill 142 today. I’m Chris Dorr, the Director for Ohio Gun Owners, and my testimony to you today is against the proposed substitute language for HB 142. Ohio Gun Owners was happy to support the original HB 142 because it removed the onerous, anti-gun provision in current Ohio law that forces a citizen to notify an officer that they are exercising a Right. In fact, Ohio Gun Owners, along with the Buckeye Firearms Association, Ohioans for Concealed Carry and the National Rifle Association all testified in favor of the original language. And several of these organizations, ours included, mobilized their members to this no-compromise legislation because it was a good bill that accomplished a restoration that gun owners deserve. For this committee to now swap out all that grassroots support in favor of a piecemeal substitute that doesn’t go nearly far enough is disingenuous in the extreme. Who is this committee trying to placate here? As I already stated, pretty much every gun rights organization in Ohio already supported the no-compromise version, so I can only assume it is being done to placate organizations or other politicians that do not have the full restoration of gun owners’ rights at heart. As John Hohenwarter from the NRA said so excellently in his previous proponent testimony on the original version, HB 142 as originally written fixed mistakes from the early 2000’s that were made to get concealed carry passed back then. But back to this compromised substitute language, none of the underlying principles have changed. Criminals will still refuse to produce their CHL cards when they are asked for their ID. If their intent is to kill a cop, they’ll ignore this compromised language just like they ignore the current law. We don’t have problems here in Ohio with law abiding gun owners threatening law enforcement officers. It isn’t law-abiding gun owners that disrespect, threaten or shoot law enforcement officers. Whatever party is trying to be placated by this substitute language should be the ones forced to settle for less than what they want. As for gun owners across Ohio, we won’t settle for this. Legislation like this will not be accepted as a substitute for passing major pro-gun reforms like Constitutional Carry and Stand-Your-Ground legislation, bills I might add that are passing in states all across America. I thank you for this opportunity to testify before you today in opposition to the substitute language for House Bill 142. If you aren’t already a member of Ohio Gun Owners and you are a 100% pro-gun unapologetic American who loves your Second Amendment rights, please consider joining us today! P.S. Please read the email above for a recap of today’s hearings on HB 142 and what we need to do going forward. If being a part of Ohio’s most unapologetically pro-gun grassroots fighting force is your cup of tea, we’d love to have you!